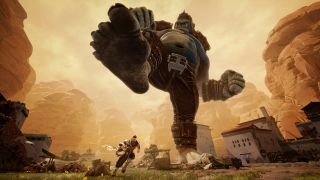 Action-combat title Extinction has been confirmed for the PC Gamer Weekender, and the Maximum Games title will be playable to all those attending the show. Extinction sees players controlling a warrior named Avil—“one of the world’s last defenders“. Your character is one of the few people in the game’s world capable of taking on the 150-foot tall ogres blighting the land. And if you can’t defeat them? Well, it’s called Extinction for a reason. Going hands-on with Extinction you’ll be able to experience a taste of the full game to come, which will feature a full story campaign with side missions, skilful combat across an interactive environment, and plenty of modes to keep you battling until there’s no more ogres to battle. You can find out more about Extinction—the game, not the concept—over on its official site. Before our inevitable extinction, you’ll also be able to see many more speakers, games and booths all at the PC Gamer Weekender, which is being held February 17-18 at the Olympia, London, in the UK. For more details see the site, and follow us on Twitter for up-to-the-minute news. Tickets are available now from £12.99. Save 20% with the code PCG.